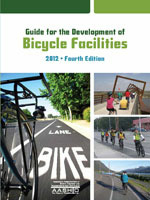 Last week, AASHTO, the national association of state DOTs, published the first update to its bicycle facility design guide in 13 years (available online for $144). Since many transportation engineers take their cues from AASHTO, there was an urgent need to update the 1999 guide, which failed to include many effective design treatments and promoted some standards that actually made streets more dangerous. The new guide includes some significant steps forward, but it still lacks the bikeway designs widely recognized as the best practice for making cycling a mainstream mode of transport. AASHTO's new bikeway design guide includes some significant updates, but not the treatments for protected on-street bike lanes that American cities are increasingly using to make cycling more accessible. AASHTO is saying all the right things as it publicizes the update. “Transportation engineers know that the entire system works more efficiently when we build streets, bridges, and highways that can accommodate bicyclists and pedestrians in the safest way possible,” AASHTO Director John Horsley said in a statement. And the guide has ballooned from 70 to 200 pages, adding much more detailed information about buffered bike lanes, bike parking, bike boulevards, and travel lane narrowing. Still, it leaves out protected bike lanes, also known as cycle tracks, which the world’s best bicycling cities — and America’s most bike-friendly transportation departments — have employed to make biking safer and broadly accessible. On the plus side, the new AASHTO guide includes several improvements over the previous one. It recognizes different types of bikes and attachments like trailers, and acknowledges that some of these require wider and buffered bikeways. Incorporating bike lanes with angled car parking used to be unheard of — now it’s in the manual. Schultheiss also said AASHTO is hoping to move toward five-year updates. Thirteen years would be a long time to wait for state DOTs to finally sanction protected bike lanes. Tanya – do we know the individuals behind this report? Who is it who writes a report that will be so influential, but seems to be so far behind the times? And one more question: If the NACTO guide is so much better, how do we encourage our local city and state DOT to follow the NACTO guide as opposed to the AASHTO guide? Unprotected bike lanes are just not going to do it. Parents won’t let kids ride to school in them. People are afraid. When I lived in Athens, GA, local transportation policy was so backward that AASHTO was considered too progressive. Far as I know, same guy runs the transportation department to this day. 1) Does the AASHTO guide still discourage the use of cycle tracks? If not, why wouldn’t they provide design guidance? 2) Why didn’t they include cycle tracks in this edition in the first place? 3) Are they considering adding cycle tracks in future editions? Tanya – I have one question in regards to your piece. You state that the 1999 guide “promoted some standards that actually made streets more dangerous.” What were those provisions? Also, I don’t think the guide discouraged cycle tracks. It did discourage pathways adjacent to roadway which are pretty much everywhere. @d4002932d80e15d5bc09f153c8bb5b83:disqus The “wide outside lane” standard that Bill Schultheiss mentions at the end of the piece is a recipe for higher motorist speeds, not safely accommodating cycling. It doesn’t seem like adding bike lanes with angled parking is a safety improvement, unless it’s back-in angle parking only. No cycle tracks (a cutting edge innovation in the Netherlands circa 1975) in a 2012 manual? How absolutely pathetic. I don’t know how the Toole Design Group people can look at themselves in the mirror. Toole Design Group and Bill Schultheiss are the leading firm in doing innovative bicycle designs. I worked with them on DC’s 15th Street cycle track, Pennsylvania Ave bike lanes, New Hampshire Ave contra-flow lanes, and many others. They have designed the majority of DC’s bike lanes that have been installed over the past 5 years. So if you think DC is bike friendly, you can partially thank Toole Design and Bill Schultheiss for it. Without knowing all the details, I imagine there was some internal discussion at AASHTO about including or not including specifics on cycletracks. Bill knows every possible detail about cycletracks, but he is not the final say on AASHTO publications. Speculate on internal disputes at AASHTO as you please. Since some comments and Tanya have pointed to the NACTO guide as more progressive on cycletracks, and a model AASHTO should have used, guess who was a major contributor to the NACTO guide… If you guessed Bill Schultheiss and Toole Design Group, you are a winner. In short, Bill and TDG have been leaders in the field, and have designed some of the most innovative bike facilities in the U.S. If your problem is with AASHTO’s guide, don’t blame Bill/TDG. It’s likely that there’s something more to it. I just don’t understand what the problem is. Clearly, there is someone at AASHTO who doesn’t like the idea of cycle tracks, but why? Are they just dogmatic vehicular cyclists? Will research showing that cycle tracks are safe sway their view? Will it take political pressure? Without any justification for this gaping omission, we can only speculate. J doesn’t understand the problem. That’s because the cycletrack advocates sweep the fatalities under the rug. “Protected” bike lanes don’t protect cyclists — they hide cyclists from motorists until the moment of impact — at intersections. That’s exactly how Kathryn Leah Rickson died in Portland last month, how Brett Jarolomek and Tracy Sparling died in Portland and Bryce Lewis died in Seattle, how Alice Swanson died in Washington DC, how two others died in Minneapolis in the last couple years, how a woman died in Blackstone, Virginia, how four people died in Amsterdam in one year, how two school children died in Copenhagen so far in 2012. This is a partial list. Davis, California experimented with cycle tracks in the 1960s and 1970s, counted the carnage, and discontinued the experiment. Today’s cycle tracks are no better. The paint is prettier and the design firms have better ties to government funding, but hiding collision participants from each other is not safe traffic engineering. Portland has had a slew of non-fatal collisions caused by what they call “separation” in the last four years. City traffic has intersections. That you cannot change. You can make the intersections more dangerous, as the bike-industry-funded lobbyists want you to do. Or you can both use _safe_ techniques to make streets more pleasant, and address serious behavior questions on the part of all road users. By contrast, AASHTO has for years listed very specific problems with the facility-du-jour, now called cycletracks. John Schubert has listed some victims of that design, and there are more. Others have told me about a similar installation years ago in Columbus, Ohio that was soon removed because of carnage. Still, the “innovation above all” crowd calls for mythical protection, based on fear mongering and false claims that you can’t ride safely if there’s a car around. Yet even average cyclists ride many millions of miles between fatalities, with competent cyclists far safer; and every study ever done has found that the benefits of cycling greatly exceed its tiny risks. The “innovative facility” professionals need to stop using fear mongering to promote their design services, and they need to adopt science, engineering and ethics. Bicycling on ordinary roads is NOT dangerous. It does us no good to pretend it is. Tanya Snyder, you seem unfamiliar with the studies of movement-based bicycle crash analysis. I humbly suggest that you can do better reporting if you learn the insights that NACTO, Bikes Belong and LAB want to hide. Let’s start from a user perspective: How would a cyclist ride on ordinary streets, safely, with low stress? The Bikes Belong party line is that only “confident and fearless” people can do this. That’s slander. The real answer is that it’s easy. You ride a little differently, you learn a bit about how traffic interacts, and voila! You’ll think, “Gee, all those motorists around me got a lot smarter!” But the motorists didn’t change. What changed was the cues you gave them. Studies from Copenhagen, Helsinki, Amsterdam and Berlin show alarming collision rates caused by the facilities that NACTO (funded by the bike industry) is promoting. Anyone who wants these studies, contact me through my web site, Limeport.org, and give me an e-mail address to send them to you. lacks the bikeway designs widely recognized as the best practice…” by whom? AASHTO is not a cheering section for butts on bikes, but a very conservative engineering organization. I would expect them to defer acceptance of new designs pending a long term analysis of safety and traffic efficiency. I not only would expect them to do that, but would hope they would do that. In this case, Streetsblog seems to be the “glass is half empty” section. Critics of new designs are there for a reason–someone has to be the hard edge of critical review, and that sure ain’t the advocacy folks. Having worked with my very conservative county traffic engineer for going on ten years, it took me a while to appreciate his “first, do no harm” approach, but the longer I worked with him, the more I admired his critical nature. We should embrace a conservative approach. If NACTO designs weather the test of time and critical review, I am sure they will eventually be blessed by even the old critical coots among us. If not, they do not deserve to be. Written by Prof. Andy Cline, a journalist professor at Missouri State Univ who gets around primarily by bike. Cycle tracks were not involved in any of the deaths cited by @John_Schubert:disqus (I looked each one up). His citing them is troubling at best. Nor are cycle tracks new or radical, as @google-5385de87e3db72b13db5742f658c24ba:disqus would have us believe or their proponents “innovate above all else”, as @0c989b77b5ede7d204fc3585bdab2a14:disqus declares, since cycle tracks really aren’t that new or innovative. They have been installed by engineers, using science, engineering, and ethics for over 40 years in many countries. There are very conservative engineering guides they have studied how to best go about designing them based on the 40 years of knowledge and experience. The countries and cities in the Netherlands where cycle tracks are most prevalent have the HIGHEST rates of cycling and the LOWEST rates of cycling injuries or deaths. It seems pretty obvious to me and my fellow advocates that they are doing something right. Why AASHTO would not want to at least try to replicate what has been done in the Netherlands (and elsewhere) and learn from their experience with cycle tracks is beyond me. The anonymous J’s defense of cycletracks seems to recognize no distinction between correlation and causation. Are cycletracks in certain Dutch cities the cause of the high cycling rates and low injury rates? Or are cycletracks present because pre-existing large numbers of cyclists mistakenly demand cycletracks, based on the same propaganda we see here? Northern Europeans also have far more important influences, for example: Very compact cities, narrow clogged streets, short travel distances, extremely expensive fuel, very stringent and expensive requirements for driver’s licenses, very heavy taxes on car purchases, very good public transit, very flat terrain, milder climate than most of the U.S., and perhaps most important, a long and unbroken culture of utility and recreational cycling. They also have legal principles that presume a motorist at fault if he injures a cyclist or pedestrian. The U.S. has none of those. When I’ve traveled in Europe, I’ve seen much more cycling in _all_ cities than in the U.S., including streets, cities and towns with no special bike facilities at all. Transplanting one feature (cycletracks, which BTW are still very uncommon over there) will not make the U.S. into Amsterdam or Copenhagen. Far better would be educating cyclists to ride properly and confidently on regular roads (NOT just on fancy facilities), and educating motorists to respect cyclists’ rights to the road. The four deaths in Amsterdam were in actual cycle tracks. The difference between a cycle track and a coffin corner bike lane is meaningless insofar as the mechanics of coffin corner fatalities are concerned. Turning truck, cyclist to the right of the truck. The only difference is that a cycle track traps you in the coffin corner, whereas with a mere bike lane you could, if you knew to, ride in a safer part of the road. A cycle track has the potential to cause more deaths than the coffin corner bike lane. Both designs are abhorrent. I disagree with Krygowski that the only way to ascertain safety is to do before-after counts. That’s the statistical mindset. Statistics are useful, but thoughtful analysis of accident causes and countermeasures is essential too. If you do a time-motion study of turning vehicles, blind spots, and juxtaposition of truck and bicycle, you will have a hard time defending either coffin corner bike lanes or cycle tracks. Note that anonymous J jumps from the question of accident causation (which I believe he did not address convincingly) to the question of mode share. I dislike that jump. Let’s teach people to be safe, without compromise. Worrying about mode share comes after that. Europe does many things well. But Europe also did World War I. Let’s not worship their failures uncritically. J, how many deaths WOULD it take to make you reconsider? Cycletracks are relatively new in a U.S. context. I didn’t say they were radical, so I would appreciate if J would please be more careful of what he says I am saying. Frank Krygowski points out the many reasons why installing cycletracks in a U.S. city provides a very different context, legally, socially, economically and structurally, than their use in European cities. As far as statistics. You can do a lot by analyzing design in terms of traffic flow, but the bottom line is we all need numbers to hang our hypotheses onto. I’d not push for more installations until we have more of those carefully peer-reviewed before/after studies into the operation, safety, and cost-effectiveness of cycletracks (in terms of moving people per dollar, reducing overall traffic congestion, and urban crash rates per mile of cycling). To some degree, NACTO came into existence out of frustration with AASHTO’s conservative nature. AASHTO is not out there to put more butts on bikes or to extoll the virtues of social change. They are a bunch of traffic engineers and officials, hence the name. I don’t have a problem with NACTO proposing these designs; many cities have been increasingly exasperated with state DOTs and we need something to nudge old farts like me. My concern is that with any design one is adding to the U.S. traffic mix, one has to look not only at the pros (from the alternative-transportation advocacy perspective) but anticipate any unintended consequences, and fix problems rather than wish them away. John Allen has done a very nice job (read time, money, and sweat equity) on his own web site of critiquing some new U.S. urban bike facilities. He gives good grades to a few, and not so good grades to others. I’m not terribly interested in putting more people onto facilities as rolling experiments in mortality rates–let’s make sure we get it right the first time. “…Austin, Chicago, Memphis, Portland, San Francisco and Washington D.C. So it sounds like in a few years we can bring the jury in on some of these designs and find out what really works, what to avoid, and what needs some re-thinking. But let’s not put the cart before the horse: no one should decide what to make “mainstream design” until we see it work in these cities (I hope good thinking makes for good design), nor should anyone twist arms to have engineering societies bless something when we obviously haven’t even worked the problem yet in U.S. cities. Start collecting those numbers, folks. Gasoline probably won’t be getting much cheaper unless the economy continues to tank and sedentary humans aren’t going to save on health care bills if they sit on their asses and get fat. But let’s not lead anyone down the yellow brick road, either. The Wizard of Oz wasn’t all he was cracked up to be and the bottom line of that allegory was that Dorothy, the Tin Man, the Scarecrow, and the Cowardly Lion already had what they needed in their hearts–they just didn’t know it. @0c989b77b5ede7d204fc3585bdab2a14:disqus @John_Schubert:disqus Categorizing me and other cycling advocates as homicidal maniacs, hell-bent on death, is false, hyperbolic, and does little to further the debate. The fact remains that the US has very low rates of cycling and very high rates of injury and death while countries in northern Europe have very high rates of cycling and low rates of injury and death. Clearly, what we’ve been doing for the past 40 years has not been working, and what they have been doing for the past 40 years has been working.There is a clear example of a society with high rates of cycling, low rates of injury, and widespread use of cycle tracks. There is NOT and example of a country with similarly high levels of cycling and similarly low rates of injury without widespread use of cycle tracks. If there is, I’d love to hear about it. I guess I just don’t understand why we wouldn’t try to replicate the successes of the most successful cycling country in the world.Designing cycle tracks is not easy, which is precisely why we need engineering guidance to do so properly. However, AASHTO, for whatever reasons, continues to shirk its duties. @google-5385de87e3db72b13db5742f658c24ba:disqus Glad to hear a more reasoned approach. I agree that designs should be constantly studied, tested, and improved. We should learn as much as we can from the experience in Europe so we begin with 40 years of experience behind us, and then improve from there. AASTHO could help provide the guidance for a better starting point on those designs, which would probably be much more conservative than those provided by NACTO. However, without any guidance from AASHTO, many engineers are left on their own when designing cycle tracks. Anonymous J, that is a strawman argument that is beneath you. We didn’t say those things. Yes, they are easier to respond to than our actual criticisms, but that just wastes hot air on irrelevancies. Traffic safety is a good more deal complex than copying a single visible aspect of another country’s system. Whatever safety benefits you see in Europe occur despite, not because of, cycletrack coffin corner intersections. Get the studies. Their accident data is compelling. Gasoline costs about eight bucks per gallon in Copenhagen, and cars have a 200 percent sales tax, so your $20,000 Chevrolet actually would cost $60,000. And Copenhagen was built centuries before U.S. cities, with walkable distances. The summers are cooler and the winters warmer than most U.S. cities. (My wife used to live there, and it hardly ever gets below freezing.) Parking is fiercely expensive and deliberately made inconvenient. Now: do you STILL think cycle tracks are the principle driver of mode share choice, given all these other factors? Get this: this morning, 60 percent of Copenhageners got in cars for their daily trips — despite the cost and inconvenience. Did you know that about half of all Copenhagneers think bicycling is dangerous? They’ve had cycle tracks for many years, and some of them see through the “make them feel safe” nonsense. We’ve offered you pointers to some good information about HOW accidents occur. At every turn, you duck that information and retreat into hand-waving generalities. The “what we’ve been doing for 40 years” is a false characterization. I’m going off line for a week. If you’re interested in learning something, contact me through Limeport.org, and I’ll be in touch when I get back. John – I think you are being a little economical with the truth here. Quite a sizable percentage of the Copenhagen population walks and takes transit for their daily trips so I believe your 60% number is rather inaccurate. I suspect your “half of all Copenhageners think bicycling is dangerous” may be equally flawed. I am always interested in learning more though, so do let me know if you have citations for these numbers. J, I never said what you claimed. Don’t be dishonest. Promoting weird or hazardous bike facilities is generally a result of naivety or lack of engineering sense. Homicide is different. Furthermore, your claim that the U.S. has “very high rates of injury and death” from cycling is absolutely false. For the past ten years, there have been on average only 730 bike fatalities in the U.S. That’s tiny, compared with roughly 4000 pedestrians per year and well over 30,000 motorists per year. The bike deaths are down close to the number of deaths from poisonous gases – hardly a big national concern. Canada has frequently had more deaths due to falling out of bed than due to biking. And U.S. cyclists are estimated to ride anywhere from 5 million to 15 million miles between fatalities. How many years will it take _you_ to ride 5 million miles? Injuries? Basketball players check into emergency rooms more often than bicyclists, despite FAR fewer hours of exposure. And the overwhelming majority of bike ER visits are for minor injuries and wasted “just to be sure” visits. Road rash on the legs is the most common injury treated. Unfortunately, like most facilities advocates, you’re engaging in fear mongering – telling people that riding a bike is terribly dangerous. Sorry, but that’s a lousy way to promote bicycling. Bicycling is NOT very dangerous. It does us no good to pretend it is. Frank, while I concur that bicycling isn’t dangerous (although it does have risks) and we shouldn’t promote it as such, the numbers comparing the US situation with the Dutch, Danes, Germans, Swiss and many other countries really do speak for themselves. Even absent a meaningful exposure rate, the amount of cycling and the numbers of fatalities in the US are light years behind these other countries. See this info for some data. They actually died in a far western exurb where the car is more dominant and cycling, while provided infrastructure, is not used by the same numbers as in Copenhagen, which is to be expected for a low-density “parcel house” area. Death by right-hand turn in all of Denmark (population 5 million) for 2010 was 5, out of a total of 19 for all cyclists killed. Of course in this statistic, I ignore the John Forrester induced mode share of 1% in Southern California. So to account for Denmark’s overall national 18% share, you’d have to multiply that 25 by 0.0555. With cycle-tracks, in a Denmark with 1% modeshare like Southern California, only 1.3 people would die every year. Thus spaketh I the truth to MAMILs. You can’t just look at absolute number of deaths when doing comparisons. Otherwise, my home state of Florida, which happened to have the highest number of cycling fatalities of 107 in 2009 for the US (NHTSA data) would appear to be way ahead of the Netherlands, which had about 186 in the same year. I couldn’t find the cycling rate for FL that year, but it is 27% for Netherlands. For simplicity’s sake, I’ll assume the entire population that country cycles. That would make it about 4.5 M for Netherlands. I don’t know what FL’s percentage is, but I can guarantee you there aren’t 4.5 M people of all ages and demographics cycling on the city’s streets every day. That would mean that Florida’s cycling commuting rate is around 20%. This state is not particularly well-known for doing progressive transportation planning. Furthermore, a larger portion of the Dutch population commutes by bike to places. The 27% daily cycling rate doesn’t mean that the other 73% of the Dutch don’t cycle. They just don’t all bike to work every single work day. It is very common for the elderly to cycle in that country, and normal for schools to have the majority of kids bike there everyday. I pass three schools on my way to work everyday (2 elementary and one middle) and live across a HS. I’ve yet to see a single kid bike to school, or anywhere in this city for that matter. Heck I’m lucky if I see another cyclist in an entire week on my commute to FSU and back home. Here are the links for where I got the cycling fatality numbers. Plenty of cities in Europe have adequate average income among the populace, good weather, high car purchase taxes, expensive gasoline…and very little bicycling. Are there any medium-to-large European cities with large bike modes shares that do NOT have special infrastructure for cycling? It’s clear that Americans aren’t buying what the vehicularists are selling*. Cycletracks and other innovative facilities are worth a try. * I say this as someone who has read Effective Cycling and who feels enormous gratitude to Forester for writing the book, the tenets of which have been the foundation of 20 years of collision-free riding for me. Still, Hiles’ “Listening to Bike Lanes” trumps all. Most Americans find bicycling somewhat appealing but will never take bicycling serious enough to enroll in instructional courses. For the unwashed masses, bicycling is a folk activity done without much regard for formal rules. As challenging an attitude as that is for those of us who are obsessed with these matters, it’s the way it is in America. If our primary goal is to increase bicycling (versus, say, the goal of defending the right of competent cyclists to operate on the roads as users of vehicles) we’re better off going to where the people are as opposed to trying to convert to our way of thinking. — I’m not here to defend, nor prosecute, John Forester. I regard his books as a first draft of what cycling can be. Vastly better work has expanded on his insights in the decades since, and there are many presentations of safe cycling that are far more pleasant and inviting than Forester’s Effective Cycling. The “You lead the dance” video on commuteorlando.com is the best example of this. — RTcandy (my, what a nom de whatever), I am kicking myself about that Copenhagen statistic. I saw it one day when I was plowing through a huge stack of e-mails and posts. It did come from a real survey, and I regret I don’t know where. I didn’t save it. — Copenhagen had huge mode share before the infrastructure. So did Davis, CA. History gets its sequences mixed up. — I don’t regard ANY person as expendable on the altar of mode share. Facilities that hurt and kill people have no moral justification. I am capable of making cycling pleasant without resorting to the chicanery of dangerous-but-cute facilities. Other people are similarly capable, some even more capable.. It really comes down to properly designing the facilities. Most of what I’ve seen in the US is utter crap, bike lanes that are maybe 3 feet wide, often full of debris, sometimes blocked by parked cars, not connected, get no priority even from side streets, end before the intersection and often on roads where it’s not needed most to begin with. This is not what the Dutch or Danes have built. Yes both of those countries had a strong cycling culture, but that began to decline starting in the 50’s. They reversed the transition to car-centric development in the 70’s and are where they are today. There are plenty of videos these days that showcase the quality of the infrastructure, with of course the Dutch having the best by quite a margin. For anyone who wants some video evidence that Copenhagen did indeed go through a decline in cycling modal share see the following two videos:http://www.youtube.com/watch?v=p3vxevLuElM (begin at 6:15)http://www.youtube.com/watch?v=GgZtp7rJTl0 (begin at 18:42)There’s a 25-year difference between the two videos. Watch both and tell me whether or not there’s a difference in traffic, as well as the number or speed of motor vehicles on the road. And then keep in mind it would be at least another decade (after the 2nd video) before they started addressing traffic issues. Please everyone if the bikeway is “protected” please don’t call it a bike lane. In many states use of a bike lane by bicyclists is mandatory. Let’s avoid needless litigation by referring to them as “protected bikeways” thus making it clear in those states that use of the “protected bikeway” is optional not mandatory. Thank you. Does the Gender Disparity in Engineering Harm Cycling in the U.S.? A new paper looks at what led the American engineering establishment to fall decades behind other countries on the development of bike infrastructure.